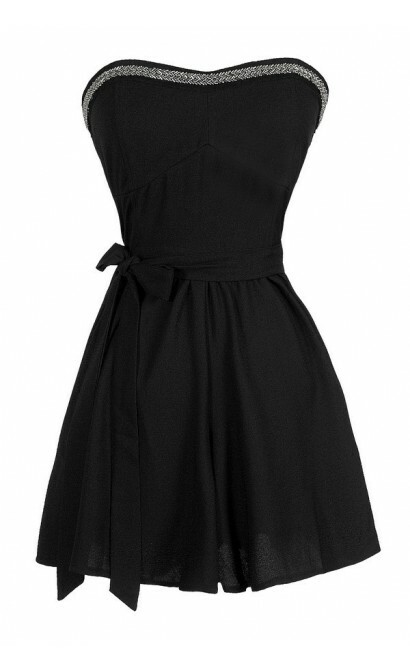 Looking for a cute alternative to a party dress? You'll definitely impress when you show up in this fashion-forward romper with embellished detailing at the bust. The Romping Around Embellished Romper is lined at the bust. It is made of a cotton blend fabric that can be dressed up or down. It has a strapless sweetheart neckline with silver bead embellishment at the neckline. The attached shorts have a loose flowy cut that makes this a forgiving look. An included fabric sash wraps around the waist and can be tied into a bow or left to hang. An exposed back zipper completes this look. The Romping Around Embellished Romper would look nice paired with black pumps and a clutch. Pair this romper with tights in the fall and winter and wear it bare in the summer. You can also pair this romper with flat beaded sandals for a cute casual look. Details: Lined at bust. Exposed back zipper. 70% cotton, 30% polyester. Lining: 100% polyester. Hand wash cold water separately. Color will bleed. No bleach. Hang to dry. Small measurements: Length from top of bust to hemline: 24". Bust: 33". You have added Romping Around Embellished Romper in Black into Wishlist. You have added Romping Around Embellished Romper in Black for Stock Notification. You have set Romping Around Embellished Romper in Black as a loved product. 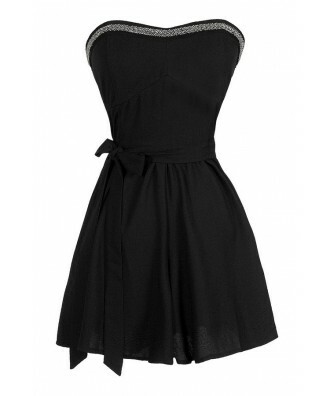 You have removed Romping Around Embellished Romper in Black as a loved product.